Members of the dance troupe “Greek Pride of Rhode Island” perform for guests at the Grecian Festival in 2011. Returning for the third year, the dancers will perform Saturday, Aug. 31, at 3 p.m.
Marlborough – Revelers will celebrate cultural traditions Labor Day weekend as Sts. Anargyroi Greek Orthodox Church hosts the eighth annual Grecian Festival, scheduled for Saturday, Aug. 31, and Sunday, Sept. 1, noon to 10 p.m., and Monday, Sept. 2, noon to 6 p.m. Activities will take place outdoors on the church grounds as well as inside the community center known as Hellenic Hall, which opened in 2011 following a fire in 2001. Proceeds from past years” festivals helped its building fund. The church had hosted a one-day festival in the 1980s and a picnic in the 1960s through “70s. Motivated to raise funds for a new community center, the parish council considered reviving the festival in 2006. Parish council member John Gagas volunteered to organize and expand it into a three-day festival, and has served as the co-chair since its inception. With the growing number of guests each year, it&apos;s been a challenge figuring the amount of food to order. Well-prepared for this year&apos;s festival, Gagas has ordered 400 pounds of lamb, 500 pounds of chicken, and 500 pounds of gyro meat and pork tenderloin. “We&apos;se not going to run out of anything this year,” he vowed. The dinner station will offer lamb shank, and lamb and chicken kebabs, each served with rice, a Greek salad and a roll. Among the a la carte items available will be stuffed grape leaves, pastitsio (baked pasta), and spanakopita (spinach pie), which Gagas noted is a popular choice. Popular desserts are loukoumades (fried dough) and the baklava sundae. Volunteers prepare the pastries that are made in large quantities at the church kitchen. Parishioners also donate homemade desserts. In addition to Greek beer, two wines will be available: Mythos and My Big Fat Greek Wine. Contributing to the lively ambiance will be traditional dance and music. Returning for the third year will be the dance troupe “Greek Pride of Rhode Island,” performing Saturday at 3 p.m.
Live music will be presented two evenings from 5 to 10 p.m. On Saturday, Dimitra Aristidou, a parishioner and professional singer, will be accompanied by the Enosis Band featuring Argiris Siopis on clarinet. On Sunday, the Ted Chingris Band will perform. Disc jockey George Regan, a parishioner, will provide music throughout the weekend. As in recent years, much of the outdoor activities will be located under a large tent. New this year, a second tent will cover the courtyard for the dancers” performance. The festival is held rain or shine. This year&apos;s proceeds will help support Hellenic Hall with mortgage payments and planned additions such as classrooms for Sunday school. For more information, visit stsanargyroi.org. Monthe Lofos and Nikki Beander, both parishioners of Sts. 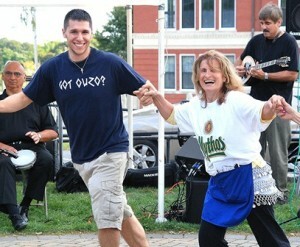 Anargyroi Church, dance along with live music at last year&apos;s Grecian Festival.